Gene Schlepp (far right) with companions. 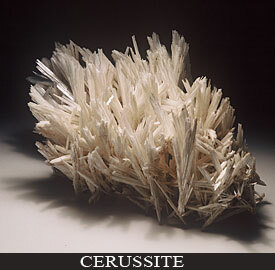 The cabinet size Cerussite in the picture came from a major pocket in the Flux Mine that Stan Esbenshade, Herb Obodda, Andy Anderson and myself discovered in the early 1980’s. It took four to five days to remove and wrap about twenty to thirty flats of the specimens. The sizes ranged from thumbnail to cabinet. Some of the cabinet specimens were up to a foot in length. 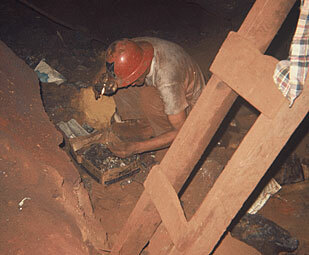 By viewing these two pictures, you can see some of the things we had to contend with in the mine. It was extremely dirty and dusty. Then there was an occasional rattlesnake or two. 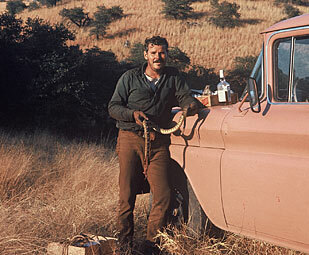 The photo shows me holding a rattlesnake that I had killed fifteen feet inside the tunnel. 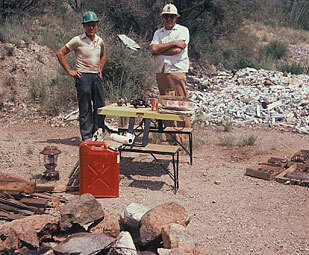 In the upcoming Minerals of Arizona book due out in 2012 will have a much longer history of the Flux mine and the various times that specimens have been found there. 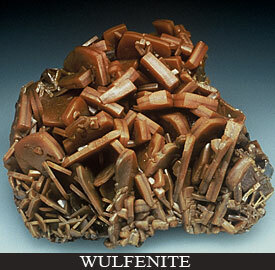 It is probably every mineral collectors dream to have been able to collect wulfenite specimens in the Glove mine. I was fortunate enough over the last fifty plus years to have been able to collect there. Sometimes the collecting was profitable, sometimes it was not. Several times in the 1980’s and early 1990’s I had leased the mine from Shelly Fox of the Serrita Land Cattle and Mining Company. 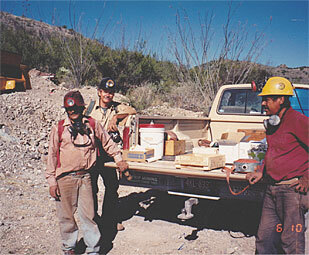 The picture showing me, two mining friends and an air compressor was the last time I worked there. After thirty feet of mucking, we were able to reach the bottom of the old stope from the 1950’s. There we discovered an open cavity six feet long and approximately two feet high. The cavity was lined with fine thin yellow wulfenites up to 1 ½ inches. This really made our hearts pound as we collected and packed the material in boxes. 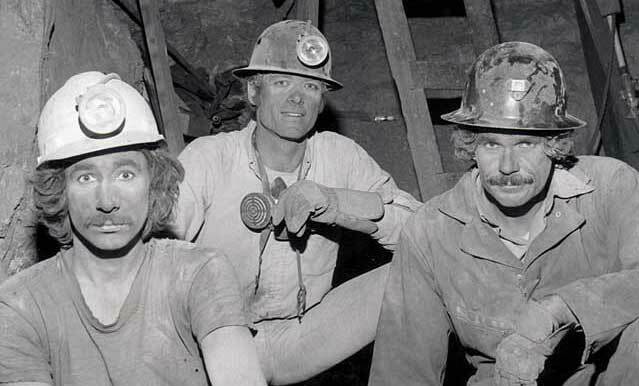 After taking them to the upper level of the mine, where they would be safe from anymore drilling or blasting we had to do, it was time for a couple of cold brews. Over the next two and half weeks we continued to drill, shoot, and muck. But alas, we never found anymore wulfenite as good as what had been left in the previous pocket back in the 1940’s or 1950’s. The picture shows again, by the looks of our clothing, that it was extremely dirty. And yes, there were rattlesnakes there also. God bless mining.